Here, local resident and real estate expert, Becky Kolb, reveals unique insights to find the perfect home in Sun Lakes, AZ… and avoid unnecessary mistakes that can cost thousands of dollars. To get your free copy of these eBooks visit http://bit.ly/buyhomesunlakesaz and fill out the simple form in seconds. 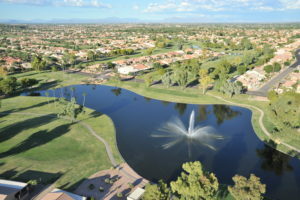 Founded in 2010, The Kolb Team is headed by Becky and John Kolb who not only sell the active adult community lifestyle, but they live it too as residents of Sun Lakes, AZ. They have been awarded The ReMax, LLC Hall of Fame, Platinum, 100% and Executive Club Awards and received the SEVRAR (Southeast Valley Association of Realtors) multi-million dollar award multiple times. In May 2013, Becky was awarded the Seniors Real Estate Specialist (SRES) designation and in June 2013, she was awarded the Accredited Buyer’s Representative (ABR) designation. When not helping clients, you can find Becky and John golfing, hiking, swimming, making new friends, and spending time with their four sons and 12 grandchildren. For help with your Arizona real estate needs, visit https://www.thekolbteam.com/. of windows and white tile floors. Found you on the Internet and saw Sun Lakes last September. I moved here in July and I am loving every minute of it! You will too!